A grand ceremony was held at the Thong Nhat (Reunification) Palace, Ho Chi Minh City on January 31 to celebrate the 50th anniversary of the General Tet Offensive in the spring of 1968. 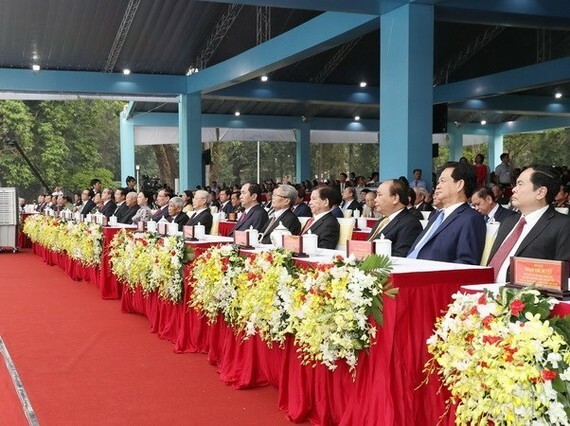 The event saw the attendance of General Secretary of the Communist Party of Vietnam (CPV) Nguyen Phu Trong, President Tran Dai Quang, Prime Minister Nguyen Xuan Phuc, National Assembly Chairwoman Nguyen Thi Kim Ngan, President of the Vietnam Fatherland Front Central Committee Tran Thanh Man, former Party, State, Government, National Assembly and Vietnam Fatherland Front leaders, and foreign diplomats, among others. The Tet Offensive began in the early morning of January 31 in 1968 when liberation forces simultaneously launched attacks on American and Southern Vietnamese bases in cities such as Hue, Da Nang, Quy Nhon and Saigon, and hundreds of towns from Quang Tri to Ca Mau. The offensive helped destroy huge amounts of facilities and logistics used by the US and the Southern regime’s armies. The seven-month long campaign ended with tens of thousands of enemy troops dead, 600 strategic hamlets destroyed and 100 communes liberated with a population of 1.6 million people. People in rural areas also took this opportunity to rise up against the US-backed government’s administration. Sai Gon-Gia Dinh (now HCM City), the headquarters of the US-backed Southern regime, was a focus of the offensive. The Tet Offensive marked a strategic turning point for the resistance war against the US and its allies. It caused the US a ‘sudden shock’, disrupting their strategic plan, shaking the White House, the Pentagon and all of the US and forced President Johnson to deescalate the war and agree to sign the historic Paris Peace Accord. The victory also helped lead to the liberation of southern Vietnam and national reunification in 1975. Addressing the ceremony, Secretary of the HCM City Party Committee Nguyen Thien Nhan described the Tet Offensive the peak of Vietnam’s history in the 20th century, and a symbol of patriotism, iron will and determination, and combat spirit of the entire Party, people and army under the clear-sighted leadership and right guidelines of the Communist Party of Vietnam and President Ho Chi Minh to gain national liberation. “We will always be proud of the 1968 Tet Offensive,” Nhan said. The celebration of the Tet Offensive which took place almost the same time with the founding anniversary of the CPV (February 3, 1930) has helped raise the pride of the Party and national strength, he said. The Party has learnt from the success of the offensive to serve the present cause of nation-building and development, he noted, saying it is the people’s assistance and support that helped the country overcome all challenges to win the ultimate victory. Therefore, Nhan said, it is necessary to build a pure and strong Party, improve the leadership capacity and combat capacity of the Party, and prevent the degradation of political ideology, morals and lifestyle, as well as the signs of “self-evolution” and “self-transformation” within the Party. At the same time, efforts should be stepped up to fight against bureaucracy, corruption and wastefulness to affirm the Party’s prestige and consolidate public trust, and mobilise national strength in order to fulfill tasks, he said. Nhan also emphasised the need to build up patriotism, especially among the young generation, to bring the country towards prosperity. Colonel Nguyen Van Tau (Alias Tu Cang), a Hero of the People’s Armed Forces who fought in the Tet Offensive, shared his pride of the victory, saying war veterans will carry forward characteristics of Uncle Ho’s soldiers and continue to devote to national construction and development. Nguyen Thi Phuong Nghi, a student of Vietnam National University-HCM City, said the young generation will uphold the values of the historic victory to embark on the forth industrial revolution and affirm Vietnam’s position in the international arena. The celebration featured special art performances in tribute to heroes of the Tet Offensive.